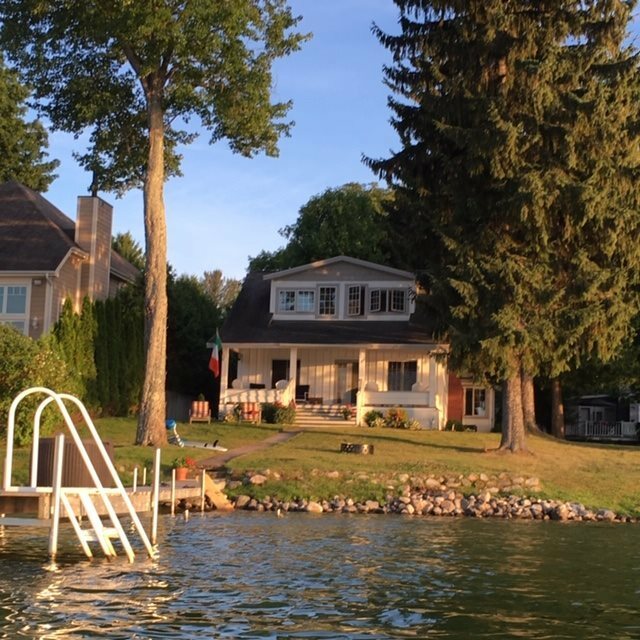 One of the best locations on Crooked Lake on highly desired Graham Rd. Deep water access and sandy at the end of the dock. Enjoy relaxing on the covered porch while watching boats and wildlife pass by. This year round cottage has classic Northern Michigan charm with numerous updates in the last 10 years. Most recently a brand new roof was installed, added insulation in ceiling and crawl space, and back deck redone. Plenty of space for the family and guests with a main floor bedroom with full bath, family and living rooms, and 2 dining areas. Nice sunny back deck and yard with 2 car garage and plenty of space for parking. Dock and boat hoist included. Neighboring home is also for sale: mls #457103..
Bath 1 Dimensions: 11'6" X 4'11"
Bath 2 Dimensions: 7'5" X 5'6"
Bdrm 3 Dimensions: 11'9" X 9'5"
Bdrm 4 Dimensions: 15'9" X 8'1"
Dining Rm Dimensions: 12' X 11'11"
Family Rm Dimensions: 17'5" X 11'10"
Kitchen Dimensions: 15'2" X 9'4"
Living Rm Dimensions: 20' X 14'1"
Master Bdrm Dimensions: 19'11" X 12'4"